A passing cold front Saturday brought mostly cloudy skies and gusty west winds. High pressure will slide through Missouri and southern Illinois Saturday night helping to clear skies and calm winds. Temperatures most of the day Saturday were in the mid-30's, but have since fallen into the 20's as the sky has cleared. Overnight lows will dip into the upper teens, to right around 20 degrees. If you're heading out for New Year's Eve celebrations, be prepared for plenty of chills. But that's all you'll have to be concerned with regarding the weather. Everyone celebrate safely and have a wonderful night! South winds will increase Friday night with the arrival of a warm front. 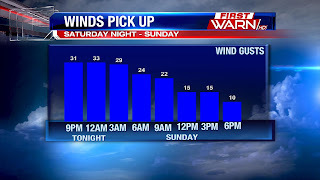 Gusts between 25 and 30 mph will keep overnight temperatures right around 30 degrees, but wind chills will make it feel more like the low 20's and upper teens. Low pressure moving over the Upper Midwest is bringing light snow in Minnesota and northern Wisconsin. Skies will remain cloudy, but dry through the day Saturday for northern Illinois and southern Wisconsin. Temperatures will briefly warm into the mid and upper 30's before Noon on Saturday before dropping into the mid-20's by late afternoon. Winds will stay gusty from the west until Saturday evening with the arrival of high pressure. With the wind lately it really hasn't felt like it, but our temperatures have been above average for the past week and a half. And through the weekend temperatures will remain above average. Monday will be the warmest out of the next seven, with highs reaching the low 40's. By Tuesday a strong cold front comes through bringing an end to the rain, but also a drop in our temperatures. Tuesday's high will reach the mid 30's, possibly upper 30's, but drop into the mid-teens by Tuesday night! That's quite a drop in a short amount of time. Highs Wednesday and beyond will remain in the upper teens and low 20's with overnight lows falling into the single digits at times. So what's with the sudden change? 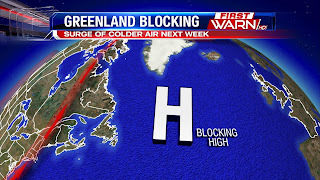 It's a blocking pattern over Greenland - known as the Greenland Block. High pressure develops over Greenland forcing the jet stream northward. That northward shift dislodges cold air from the Arctic causing it to spill south over the lower 48. And this will be quite a southward extent of the cold air as it moves all way into north Texas and Gulf states. Highs next week will run 10 to 15 degrees below average and actually look to remain below average through the first half of January. For all you snow lovers out there wondering if the cold will bring the snow with it - doesn't look too likely. We may have a few smaller systems roll through, but no major snow makers on the horizon just yet. Got big plans for New Year's Eve? Well don't worry the weather won't hold you back! No big weather concerns going into the holiday weekend, however it will be chilly if you're heading out for New Year's Eve. A cold front will pass Saturday morning and while it comes through dry, cold air will filter in behind it. We'll start in the low 30's by Saturday morning with mostly cloudy skies, but once the front passes, temperatures will be falling through the afternoon. We will spend most of Saturday in the 20's and then overnight lows will fall into the upper teens. You'll need the coat if you plan to stay out overnight. Winds will be lightening overnight, so chills won't be too low despite temperatures in the teens. New Year's Day looks fantastic with highs in the mid 30's and finally more sunshine. Mostly sunny skies persist through the afternoon with southerly winds at 5-10 mph. We've had a bit of a break from the very cold arctic air that invaded the Stateline starting the second week in December. Our coldest day of the month occurred on December 19 when we bottomed-out at -13 degrees! Starting on Tuesday, December 20, our temperatures started to moderate and a majority of the days have been above average since then. That trend will continue until Tuesday January 3, but then the arctic air will make a rebound. Long term models are indicating we could have a week of very cold arctic air that week. The cold air is arriving right on time as our coldest temperatures of the year on average occur between January 6 and January 22 when our average high temperature is 29 degrees. Get ready to break out the cold weather gear again! but westerly winds will gust even higher through the late morning and afternoon. Behind a departing cold front, westerly winds have strengthened to 10-20 mph sustained and will gust as high as 40 mph, which is just under Wind Advisory criteria. This will make for difficult driving on north - south roads today, especially for high profile vehicles. One thing you'll want to watch for will be passing flurries and light snow showers this afternoon and evening as another wave behind the low traverses the area. It won't accumulate much, but it will create a few slick spots, along with that it will drop visibility for the commute home. The coverage of the snow won't be much, but you might want to check out the radar before you head out. Light snow will be possible through about midnight. Wednesday will be another day with breezy conditions, but it will help temperatures rise through the afternoon. Ahead of an incoming low pressure system, southerly winds will increase drawing in a more mild air mass today from the south. Despite partly sunny skies, highs today are forecast to warm 10° above average for this time of year which is 30°. Most areas will notice highs near 40° and to the south near Dixon, mid 40's will be possible. Unfortunately the mild air won't last long, the cold front passes late tonight turning the surface winds to the WNW. With a tight pressure and temperature gradient, winds will be able to gust fairly high. Expect winds gusting up to about 35 mph through the afternoon behind the front. The incoming cold air will keep temperatures in the low 30's but wind chills through the day will be in the low 20's. This is it! Just a few more days left before we begin a new year and a new weather pattern change. Temperatures for the last week of December will remain very close to, if not above, average. Average highs are in the upper 20's to right around 30 degrees. Each day this week will warm a little that 30 degrees. One of the reasons for a more 'milder' week is due to the position of the jet stream. The cold air has retreated back north with the jet stream riding close to the U.S/Canadian border. We also lost a significant amount of snow cover just within the past couple of days. It was just over the holiday weekend that we still had several inches of snow on the ground. But after a warmer weekend and rainfall Sunday night, we lost a lot of that snow. Our surface winds will be coming in from the southwest this week, originating from an area that doesn't have any snow cover over it. With these winds moving into an area that now has little snow cover, the air mass will be able to sustain some of its warmth. So temperatures on Wednesday will climb close to 40 degrees. Unfortunately, winds will help to counter that as gusts reach 30 mph. This will make it feel more like the low 30's, even upper 20's in a few locations. Looking out ahead into next week it appears as if temperatures will drop back once again with a high probability of much of the U.S. falling below average. The third map on the left is the 8-14 day outlook from the Climate Prediction Center. The jet stream will once again take a big dip following low pressure Monday and Tuesday. This will pull down the colder air that retreated back north after the last cold snap. This one might be a little colder than the one we experienced just a couple weeks ago because there is much more snow over the Upper Midwest and Northern Plains. Last year the Stateline experienced the impacts of an El Nino winter, which means on average the Midwest experiences a warmer and drier winter compared to normal. Typically, but not always, the reverse a La Nina will then set up for the following year. This year a La Nina Advisory has been issued for the winter, but it is a fairly weak set up before transitioning to ENSO (El Nino Southern Oscillation) neutral conditions in January. Every El Nino and La Nina are different, but a generalized outlook would show a couple things. High pressure builds in the east Pacific as the air in that region sinks. The active pacific jet weakens as it gets closer to the west coast with a more active pattern in the west Pacific. However, the storm systems still need to find a way around the blocking high pressure. In general this creates a more active pattern for not only the Pacific Northwest but for portions of the Midwest and Great Lakes region, as the jet stream brings the storm tracks overhead. While in the south they stay drier with this typically more active area now much more quiet. This means the Stateline area has a slightly higher chance to see more precipitation. Not only that but with the polar jet forced north because of the high pressure system, it dislodges colder arctic air, and areas in the northern Plains will typically have a colder than average winter, and with colder air trapped in the northern half of the country, the south will typically be warmer. But again this is just an idealized depiction of La Nina, for more information and detail on ENSO and both La Nina and El Nino, you can click here or here. After a very cold start to the month of December, our temperatures have made a strong rebound. We made it up to 48 degrees today - which is 18 degrees above our average high of 30 degrees. 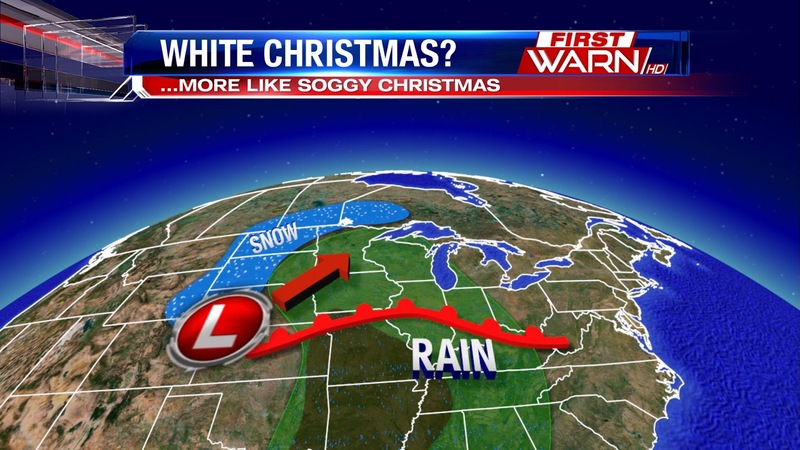 At least most of our snow stuck around to give the Stateline a white Christmas! Heading into the week ahead, our temperatures will drop much closer to normal, but will continue to average above 30 degrees. The storm track has moved to the north, so temperatures will continue to average on the warm side. We will have a chance for snow showers on Thursday and our next significant chance for precipitation appears will be next Monday and we should be on the warm side of the storm again and have rain instead of snow. The weather this weekend may have been a little frightful for travelers in the Midwest. From blizzard conditions over the Dakotas to heavy rain producing thunderstorms in the mid-Mississippi River Valley, we had quite the range of weather. Locally it wasn't as bad, but we did have quite a bit of cloud cover and dense fog Sunday evening. The clouds and fog were caused by an inversion. An inversion happens in the atmosphere when warmer air occurs over a relatively cooler surface. Temperatures were warming into the 50's a few thousand feet above due to strong southwest winds, but temperatures at the surface were not able to warm as fast. Inversions work to trap moisture close to the surface creating low clouds and fog. That's exactly what happened over the weekend. Strong southwest winds ahead of a developing low pressure system pulled in an extremely warm air mass into the Great Lakes. But because of the snow on the ground our surface temperatures were not able to warm as fast. It wasn't until the rain and drier air aloft came in this morning that we were able to break out of the overcast and foggy sky. Good morning! It might have been a bit of a foggy drive for some Monday morning as the visibility dropped down to less than half a mile for areas east of Rockford. As the rain showers passed, visibility improved and will not be much of a concern through the remainder of the morning. Following the cold front winds will increase mid-morning with gusts between 35 and 40 mph. A Wind Advisory has been issued for Green, Rock and Walworth counties beginning at 10am and lasting through the evening. Winds gusting to 30 mph will continue tonight. Overnight temperatures will fall into the low to mid 20's which will produce wind chills down into the teens by Tuesday morning. The snow is coming to an end Friday evening but with temperatures right around 32 degrees and drizzle developing behind the snow, icy spots are possible through Saturday morning. Please use extra caution if driving this evening and Saturday morning. You can't see black ice as it only appears as if the road surface is wet. Overnight lows will remain between 30° and 33° Friday. It looked just like a snow globe Friday when the snow was falling. The snow was quick to accumulate on the roads, but was beautiful to look at as it. And the size of the snowflakes made it look even more magnificent. But have you ever wondered why snowflakes are the way they are? And what was happening in the atmosphere Friday evening to allow such huge snowflakes to fall? When trying to understand what occurs in the atmosphere, we have to think three dimensionally. An individual snow crystal is small in size and has six sides. A snowflake is made up of several of these six sided snow crystals. The snow to liquid ratio will determine whether a snow is more dry or more wet when it falls. When the atmosphere is very cold and doesn't have a lot of moisture, the snow is called a 'dry snow'. A dry snow has very little liquid within the snowflakes themselves (because colder air can't hold as much moisture as warm air) and tend to be smaller in size. Because there isn't much liquid within the snowflake, it will easily break apart. And that's why dry snow isn't good at making snowballs. The opposite happens when a part of the atmosphere is very close to or just above freezing. As the snowflake falls from the cloud level it will partially melt. This produces a liquid film on the snowflake. Kind of like 'glue' for other snowflakes to stick to it. As the snowflake falls through the atmosphere, it will continue to collect additional snowflakes adding on to its size. This type of snow can easily be packed together and is good for making snowballs. Strong winds break apart snowflakes as they fall. But when the wind is light snowflakes can continue to grow in size, especially heavy wet snow. In fact, these types of snowflakes can grow to silver dollar size in diameter or larger! Light winds prevent the snowflakes from breaking into smaller pieces, protecting the liquid film around them. The image to the left is the sounding of the atmosphere from the Quad Cities National Weather Service Friday evening. It's like a snapshot of the atmosphere, from the surface to jet stream level. Temperatures are located on the bottom. Locate the 0°C temperature line and follow it up through the atmosphere. Notice how the green and red lines are pretty close to it, especially up to about 4500ft. With temperatures so close to freezing, it allowed for these types of snowflakes to form. Pretty cool!! A mixture of snow/sleet/rain occurred earlier Friday afternoon, but with the arrival of colder air aloft the precipitation quickly transitioned over to all snow for most. With the quick transition and moderate burst of snow, area roads have become snow covered. The snow will be heavy and wet with surface temperatures slightly above freezing. Take it slow if you are heading out this evening. Roads are mostly snow covered north in Wisconsin and west in Iowa where the snow has been falling most of the day. 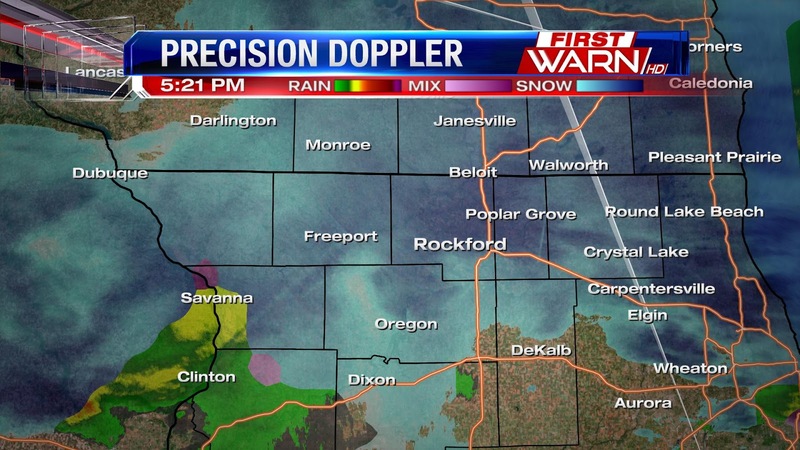 A Winter Weather Advisory continues for Green County in southern Wisconsin and Jo Daviess County in northwest Illinois. The snow will be coming to an end after 9pm, but there could be a period of drizzle following the passage of the low through midnight. A Winter Weather Advisory has been issued for Green County in Southern Wisconsin and Jo Daviess County in Northwest Illinois beginning Friday morning and lasting through Friday evening. Winter Weather Advisories extend north and northwest through Iowa and Wisconsin where heavier snow is expected to fall. The timing of the snow isn't the greatest with many finishing up last minute Christmas shopping or trying to get to their Christmas destinations. Dry air initially may delay the onset of the snow over Northern Illinois, but anticipate light snow to develop after Noon. Accumulations should remain on the lighter end with roughly 1" to 2" inches falling from Rockford to Belvidere and down through Mt. Morris to Genoa. A mixture of snow and rain is possible during the afternoon south of Rochelle, while snow totals closer to 2" to 3" from Freeport to Monroe to north of Janesville can be expected. Be careful if traveling west on Highway 20 into Iowa or north on I-39/90 into Wisconsin Friday afternoon. Roads, especially the lesser traveled roads, could become snow covered by the afternoon. Snow will be coming to an end Friday night with drier skies expected Saturday. 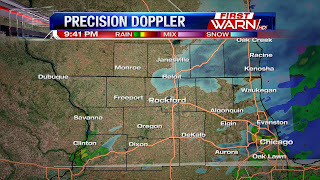 Still watching Friday mid to late afternoon for light accumulating snow fall across the Stateline. Ahead of a deep area of low pressure in the southwest, energy will eject across the county ahead of the main low pressure system. As moisture is drawn in from two sources, the Pacific and the Gulf of Mexico, moisture levels will increase Friday late morning. Lift in the atmosphere will move into northern Illinois and southern Wisconsin in the afternoon and will allow for light snowfall at first with a chance for a rain snow mix later in the afternoon as temperatures start below freezing and then warm into the mid 30's. It will be a slushy wet snow, that may be hard to accumulate at first. Overall one to possibly two inches is possible, with smaller amounts closer to the Chicago area. Though a few spots could see locally higher totals. While it won't be a high accumulation, roads will be slick as snow falls at an inconvenient time during the evening rush along with additional holiday travelers. The snow wraps up before midnight. It's official! Winter began Wednesday morning at 4:44am! This means we'll experience the longest night and shortest day Wednesday with the sun rising at 7:22am and setting at 4:28pm. The Earth doesn't orbit upright, but rather at a tilt on its axis by 23 1/2 degrees. And it's the tilt of the earth that causes winter and summer. 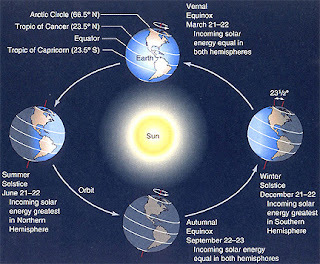 On the December solstice the Northern Hemisphere is most tilted away from the sun causing the sun's rays to shine on the Tropic of Capricorn. This is the farthest south the sun's rays ever get. South of the equator locations experience days longer than 12 hours, while north of the equator locations experience days less than 12 hours. Following the Winter Solstice days get longer and nights get shorter. If you're heading out for holiday weekend you'll want to keep an eye on the forecast. There are two systems we're keeping an eye on for the holiday weekend that could impact travel plans, depending on which day you plan to leave. If you're planning on an extended weekend both today and Thursday will be mostly free of travel issues. Despite a few flurries this morning across far northern Illinois, today will be a fairly quiet day. An upper level wave is passing through northern Wisconsin this afternoon. 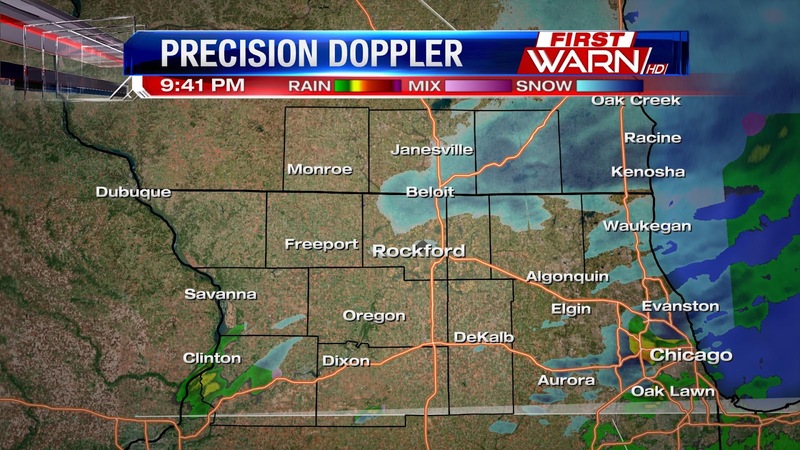 This is providing a few flurries for the Stateline, but light snow is falling in central and north Wisconsin. This could cause a few travel issues if you are heading north today, however accumulations will be low in central Wisconsin. High pressure then builds into the Plains late today into Thursday. This will allow for more sunshine across the Midwest and fairly quiet weather. Thursday will be the best day to travel, because snow moves in for Friday. Moisture will be on the increase from the Pacific and Gulf of Mexico. Combine this with an area of low pressure Friday, and accumulating snowfall is possible by Friday evening. Accumulations could add up to a couple inches which could cause some issues for last minute shoppers and evening commuters. The freezing rain potential doesn't last long Sunday morning as it transitions to rain by 9am. Light rain will arrive on Sunday ahead of the warm front, but most of the rain arrives late Sunday night into Monday morning. Even a few rumbles of thunder are possible Sunday evening and overnight. So while Christmas Day may be a bit soggy, the rain will stay fairly light through a good chunk of the holiday. Hopefully there will still be some snow around so we can call it a white Christmas! Last weekend marked the Stateline's 3rd weekend for accumulating snow in the month of December. The Stateline saw anywhere between 2-8" of powdery snow over the weekend. While the snow has been over for a few days, its still causing a few problems on local roads. A few small low pressure systems are riding the polar jet this week which is currently situated near the Canadian border, and while they pass north of us they create a strong pressure gradient over northern Illinois. A pressure gradient strengthens winds as the atmosphere tries to even out the difference.Southwest winds have been strong overnight and this morning, sustained anywhere between 15-25 mph. Because of that, and the powdery nature of the snow, there have been reports of blowing and drifting snow, especially in areas where there is little to block the wind. This causes snow covered roads making them harder to see and makes for slick roads, there have been reports of several cars in the ditch across the area. Because of that we kept the First Warn Weatherisk Moderate for Tuesday with southwest winds continuing to be breezy through the mid afternoon. This morning there have been reports of significant drifting on Hwy 20 and on Rt. 72. Winds speeds will be monitored tonight and tomorrow as well for more potential issues. Temperatures for the month of December have been well below average, especially within the past couple of weeks. But that pattern is about to change with milder air arriving at the end of this week, just in time for Christmas. A big dip in the jet stream will develop out west forcing a ridge in the jet stream over the Great Lakes and East Coast. With this pattern change, an area of low pressure will develop in the Plains and lift into the Mississippi River Valley by Saturday afternoon. Weather forecast models are taking that low west and northwest of Northern Illinois Christmas Eve and Christmas Day, placing the Stateline well within the warm sector of the storm. This means temperatures could warm into the 40's, and even 50's where there is very little snow cover on the ground. High pressure in the southeast will allow Gulf moisture to be pulled well north into the Great Lakes during this time suggesting a rainy Christmas Day, and possibly even some thunderstorms out west. Temperatures this week will warm, but won't warm fast enough for us to get rid of all the snow we have on the ground. So a slight southward shift in the track of the low is possible. However, I do think there is potential for this next storm system to be warmer because our temperatures leading up to the weekend will be warmer as the overall pattern shifts from the deep freeze to more seasonable. If we end up seeing mostly rain in and around Christmas Day, this could lead to some flooding concerns with the melting snow and heavy rainfall. If you're planning on traveling this weekend, pay attention to the forecast. While it's unlikely at this point we'll be dealing with a snowy winter storm, rain or even a wintry mix could impact your holiday plans. It was cold Monday morning! Low temperatures fell anywhere between -11° and -17° over Northern Illinois and Southern Wisconsin with wind chills as low as -33°. Thankfully full sun helped warm temperatures into the mid teens by the afternoon. Still cold, but a far cry from where we started off the day. South winds between 10 and 20 mph will continue into Tuesday morning. Blowing snow did occur primarily on east/west roads Monday afternoon and with winds still staying strong into Tuesday morning, this could create a few slick spots where the snow has slightly drifted over the road. The south winds will also keep our temperatures from dropping like they did Sunday night. Temperatures will drop down to about 8 or 9 degrees Monday evening before rising into the low to mid teens by Tuesday morning. This 'warmer' start will help boost afternoon highs into mid 20's Tuesday. Temperatures will continue to warm closer to 'seasonable' with highs reaching the low 30's by the end of the week. It's even possible we could reach the middle 30's for Christmas (or warmer) ahead of what looks to be a pretty strong storm system that will move through the Midwest. More on that coming up in a later post. So if you're tired of the extreme cold, don't worry, things are looking up from here. Officially the high for Sunday will go down in the record books as 14 degrees, even though we spent most of the afternoon below zero. The reason - that was our temperature shortly after Midnight Sunday before falling to 0 degrees around sunrise. The winds have really calmed from late Saturday evening and that has been a blessing because if the winds had been any stronger, we could have had wind chills that were nearing -30 degrees all afternoon! Clear skies, light winds and a fresh snow pack are not going to help our temperatures Sunday night. Most of us will drop down to -10 degrees, or colder, by Monday morning. And even with a wind of 5-8 mph our wind chills will fall between -25 degrees and -30 degrees through the morning. It won't remain that cold for too long, though, as a southwest wind will allow temperatures to steadily rise through the morning. This will also allow wind chills to rise out of the dangerous category. Wind chills are still expected to remain below zero through the afternoon, but will range from -2 degrees to -8 degrees during the day. It's important to remember that frostbite can happen within a short amount of time, within 30 minutes, if you are not protecting yourself. For those kids who may have to wait at the bus stop in the morning make sure they are properly dressed and layered up! An incoming cold front has been the focal point for another round of snow that arrived earlier this afternoon. Moderate snow will continue through midnight tonight and this line of snow moves northeast. An additional 1-3" of snow is expected across the area tonight, and with very cold air moving in behind the front the snow will be very powdery and fluffy. Winds behind the cold front will steadily increase turning very gusty, and blowing snow will also be a concern. 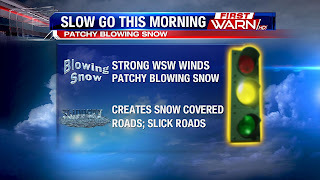 Potential hazards would be snow covered roads with falling snow, and then blowing and drifting snow, as well as low visibility in areas that have strong winds or moderate to heavy snow fall rates. You'll want to use a lot of caution if you are heading out this evening. Once we are done with the snow, the cold arctic air arrives early Sunday morning and departs Monday afternoon. But this will be extreme and dangerous cold for the area. Sunday's high will be record breaking if theforecast verifies, the record cold high is 0° for Sunday and the forecast high is -5°. We briefly making it to -5° but most of the day will be spent near -10°. Not only will temperatures be cold, but wind chill values will make it feel much worse. We can expect wind chill values through Sunday afternoon to stay anywhere between -25° to -30°, and this will also be the forecast chills for Monday morning as well. One key piece will be wind speeds, a slight increase in wind speeds will drastically change wind chills. If winds pick up a bit more than forecast, wind chills could potentially drop to -35° or lower. A Wind Chill Advisory will go into effect early Sunday morning through Monday morning, but trends will be monitored. A Wind Chill Warning is possible, but right now not in place. Regardless it will be extremely cold, make sure to take proper precautions and dress warmly. Keep a cold weather kit in your car as well, in case you were to get stranded. The good news is, temperatures will go up quickly Monday afternoon and continue to warm for the rest of the week. Another weekend snow storm is impacting the Stateline area this weekend, this time with heavier snow totals to the Northeast and lower totals in Southwestern counties. Similar to last weekend's storm, this storm is coming in 2 phases - the first phase on Friday night with snow due to warm air pushing north and a trough also pushing through the area. We may see a break in the snow later tonight and then phase II will start tomorrow around noon-time as the core of the storm passes to our South and a cold front approaches from the Northwest, triggering snow from the afternoon until later Saturday evening. After the cold front passes the Stateline, temperatures will drop dramatically, heading for a low on Sunday morning of -9 degrees! Expected snow totals from the storm vary widely from 6-8 inches for Northeastern Counties to 2-3 inches for Southwestern counties - these will be totals from both phases of the storm! Be careful driving especially on Saturday as winds will kick-up from the Northwest at 5-15 miles per hour with some gusts up to 30. Enjoy our wintery weekend! Not much has changed in the thinking or timing of the snow today. There is still a Winter Storm Warning for southern Wisconsin that will go into effect at 2pm today until Saturday evening, and there is a Winter Weather Advisory in effect for all of Northern Illinois. Snow totals will be the highest near and just north of the Wisconsin Stateline, and sweeping southeast into McHenry County with 6-8", and then totals will taper off to the south and west. 4-6" is likely south of Rockford to just north of Sterling. 1-3" is a good bet in Whiteside and Lee counties, with more of a winter mix possible as warmer air surges near the I-80 corridor. Those totals will be for the time period of Friday afternoon through Saturday evening. But, I wanted to try and break down the rough timing of the snow accumulations. Friday afternoon and evening will get the brunt of the snow with moderate to potentially heavy snow at times. Watch for accumulations north at about 2-4". Overnight is when the snow really lightens up, and even a period of sleet or a winter mix will develop (especially south) there could be an additional inch on the ground. We can expect a break from the snow ( a lot like last weekend) through Saturday morning to about noon. A strong arctic cold front will arrive Saturday afternoon, this wave of snow will bring an additional 1-3" for the area. You'll want to watch for potential blowing snow Saturday afternoon and evening with strong northwest winds behind the front. In the bands of moderate to heavy snow visibility will be reduced, along with having to deal with slick roads. If there are any changes to the track or expected impacts we will make sure to keep you posted! A Winter Weather Advisory has been issued for all of Northern Illinois beginning at Noon on Friday and lasting through Saturday night. A Winter Storm Warning has been issued for Southern Wisconsin beginning at 2pm on Friday lasting through Saturday night. Light snow has developed over eastern Iowa and northwest Illinois Thursday evening, but because the surrounding atmosphere is very dry it's not reaching the surface. During the overnight as a little more moisture is added back into the atmosphere, flurries and even light snow will be possible from about 1am/2am through sunrise. No accumulations are expected from this. The bigger snow event arrives Friday and Saturday. As of Thursday evening the forecast calls for 3" to 6" of snow over northern Illinois with lesser amounts south of Highway 38. Higher amounts will occur just over the state line in Wisconsin but I wouldn't be surprised if totals near, or above, six inches were to occur just north of Rockford. 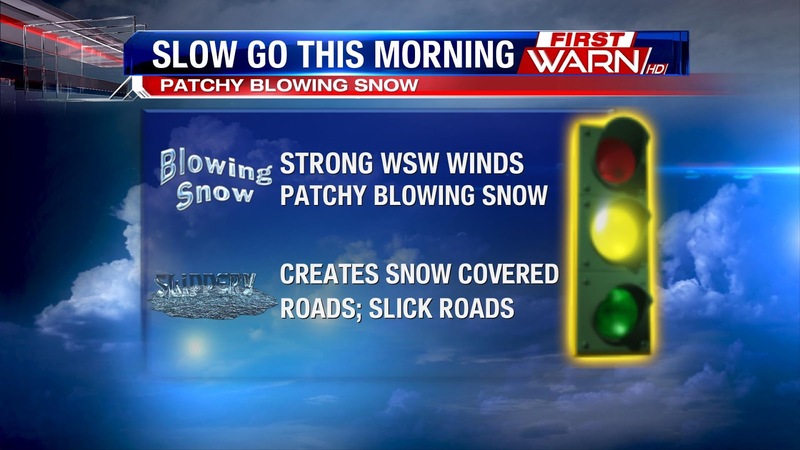 Roads will become snow covered by the evening commute and heavy snow bands will lower visibility throughout the evening. As low pressure passes to the south Saturday, heavy snow bands could once again set up over Northern Illinois. Within those bands additional snowfall amounts over three inches are very well possible. Winds increase from the northwest during the afternoon and evening causing any snow that is currently falling to blow around, and any snow that is on the ground to blow around. This will reduce visibility and have an impact on Saturday travel. UPDATE: The National Weather Service has issues a Winter Storm Warning for southern Wisconsin that will begin at 2pm Friday until Saturday evening. This is the area that will see some of the highest snow totals. 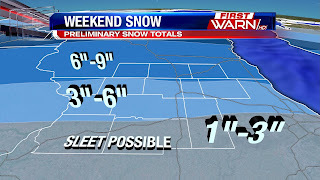 Well...its another December weekend and that means another weekend of snow for the Stateline. While details are coming together on who will see the most snow in the Midwest, we will still watch for any changes in current forecast track. If the low strengthens or shifts it's track, snow totals will be affected. For totals, right now confidence is high on 4+ inches of snow falling north of the Stateline from Madison to the Twin Cities, but for northern Illinois the confidence is a bit lower. The southwest corner of the Stateline has the lowest chance to see accumulating snow over 4". With the low forecast to track from Kansas to St. Louis and then northeast into Indiana, the highest totals will be just north of the Stateline. 8-12" of snow is possible in Madison to the Twin Cities, and Winter Storm Warnings have been issued just north of the Wisconsin Dells into eastern Minnesota. South of Madison into southern Wisconsin near the Illinois Stateline totals range from about 4-6" on snow. Orangeville to Rockford and then southeast into McHenry county have a better chance at 4-6" of snow. The farther south and west you head, totals will be dropping off. 2-3" is looking favorable for northern DeKalb county, Ogle, and Carroll counties. The lowest totals near an inch will be favored near Dixon and Sterling. The forecast is tricky though, because the biggest question is how far the warm air will be drawn northward, because the snow in those locations could actually transition over to some sleet and that would undercut snow totals in some locations. Timing out the snow; we'll watch tonight and early Friday morning with a light snow shower or a few flurries possible. At most a dusting on some surfaces Friday morning. There isn't enough moisture available for a lot of snow, but with continued southwest flow aloft, we will continue to draw in more and more moisture. Warm air advecting into the area will help with broad lift in the Mississippi Valley area and then reaching the Midwest. Friday will notice an increasing snow chance, as warm and moist air spreads over the area. A chance for snow after noon on Friday, but overall more likely late Friday afternoon and through Saturday. It won't snow the entire time, a lull is expected Saturday morning as dry air spills in. But another round of snow expected Saturday afternoon with strong cold air advection behind the cold front. Winds will also be strong from the northwest Saturday and blowing and drifiting snow will be a concern as well. Snow tapers off my Saturday evening. Make sure to keep checking back for more updates as we continue to fine tune the forecast! Impressive Snow Totals Possible This Weekend!